I'm sitting here drinking a glass of milk. 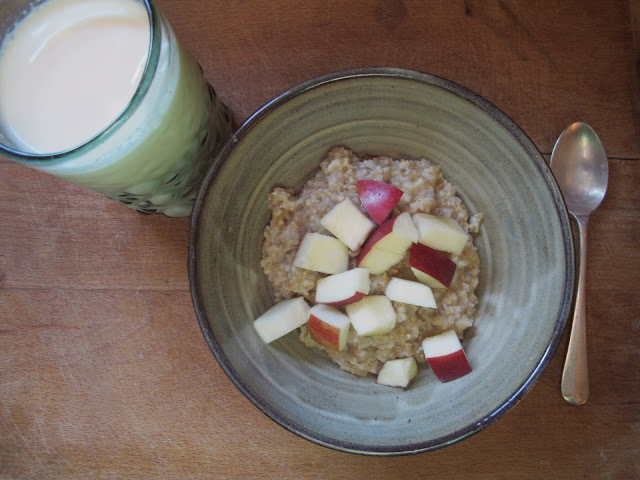 And eating this porridge with cut apple. No sooner had I photographed my breakfast and sat down to the task I tasted garlic. Oh! how easy it is to ruin such a sweet apple with a garlic'd cutting board. How stupid. And, it was the last apple. So I am trying my best to ignore the bites of garlic. This charade is greatly helped by my glass of sweet full-creamed milk. Our milk. Winnie's milk to be more correct. It's raw, unpastuerized, real, milk. It is taken from a cow that is grass fed. She is given fresh grass daily in the summer and in the late fall and winter she is given our best hay. I drink anywhere from a glass to a half gallon of this milk a day. Which is, admittedly, a lot. But, I love it that much. I have a glass or two or three with breakfast, lunch and dinner. Nick often jokes that I drink as much as a nursing calf. It doesn't do wonders for my waist, but it makes me feel as strong as an ox. In my opinion it is miles above the best product we make on our farm. The thing about milk that I think very few supermarket-Americans understand is that it is a seasonal product. Mama cows have around a similarly long gestation as women ~ about 265 days. Just like you would want to give a woman a break between nursing one child and delivering another the same basic courtesy is given to mama cows. We call it drying off. You want to give the mama cow some time to keep her nutrients and proteins and calories for herself and the baby calf she is making (instead of giving it to the milk). Dry periods vary between farms and cows but we want to give Winnie almost 4 months off this winter. She was quite skinny after her last calf so we are trying to give her a little bump in recuperation so she is healthier when she calves this spring. It is ideal for calves to be born in the spring so they are born on fresh grass and have a whole 7 or 8 months of warmth and grazing. This is thus ideal for the small farmer (me) for the time to dry off is not so coincidentally the coldest time of the year. Milk barns are generally very cold and dark places. Not where you want to huddle in January with bare hands and steel bucket. It is also ideal (as I deign to say) for the most delicious milk is made off summer's sweet grass. Sunday was our last day milking. Last week was the last week we sold milk to our customers. Its hard imparting the seasonality of milk to our customers. We aren't the only ones who sell raw milk in our little corner of Vermont and we are one of the few that dry off for the winter. (What I described above is provided your cow is bred in late summer, and doesn't work for everyone). So, I worry that we will have trouble finding our customers again come spring when Winnie calves. Someday when more and more small 1 and 2 cow dairies are allowed and encouraged to spring up around the country the seasonality of milk will come too. Then the proclaimed foodies of our country will see summer's fresh grass milk the way they see August's bulging red tomatoes. Something to be appreciated in its own time and place. As we get closer to spring when the cows will be set free of their winter pasture I will get back on my milk soapbox and talk to you about the benefits and joys of raw milk. But for the winter we will say goodbye to milk and concentrate our efforts on the June and August butter that remain in the freezer. Little frozen bits of yellow summer gold. Until April sweet sweet milk. I miss milk so very very very much since we have returned home from our internship. I agree so much and hope more and more people will begin to realize the greatness of raw milk. It looks delicious. and i've loved your blog--linked from melissa at dear baby over a year ago. thanks for writing! i had no idea about the seasonality of milk. i don't eat much dairy, and don't drink milk, but i still find this interesting (and so very logical and natural). I just found your blog through a friend and I am hooked. I envy your life and every picture makes me want to run back to the woods and set up shop on a remote piece of land. Thanks for letting us live vicariously through you! And, all this talk about milk is making me bummed that I'm lactose intolerant! @rebekah leland I would recommend going to meet the cow (s) that are providing your milk. I think seeing the animals, where they graze, eat hay, sleep, get milked, will help you a lot in feeling comfortable (or not) about their milk. You want things to be clean in as much as a farm can be clean. You want the animals to look healthy. You want the filtering and refrigeration process to be timely and clean. Raw milk is best taken from smaller dairies. Some large scale dairies will sell raw milk on the side, which is in my opinion a little gross because large scale dairies don't need the same sanitation requirements smaller ones need to meet (b/c their milk just ends up pasteurized). I hope this helps! I SO wish I could get raw milk in BC (Canada). I have tummy issues with regular store-bought organic milk so would love to try some raw, but I am told it's illegal in Canada and we do not have a cow (maybe someday). If you know different, I would love to hear it. i have been recently looking into getting raw milk in my area. like most here i did not know milk has a season. thank you for the writing about it. Kate, I so enjoy reading your posts. I grew up on a small farm in Wisconsin living in much the same manner that you are now. When I was 3 or 4 we got our first Jersey cow, Jenny, and she was with us for almost 20 years! Now my parents keep 3-5 cows at a time, usually milking 2 at once so we can rotate calving. My dad is just like you, he loves our raw milk! I enjoy reading about your life and commentary on your farm because so much of this stuff is second nature to me...I don't really think about the science behind a lot of things I grew up doing on the farm. And you photography is wonderful too. Can't wait for more milk soapboxing! I just learned so much! Drying out seems to make perfect sense (and I can tell you, after breastfeeding three kids for a total of 4 years, necessary!). I have never tried raw milk, but have read a lot about the health benefits. You two really seem to be doing it right! People will see that and come back for your milk, don't worry!